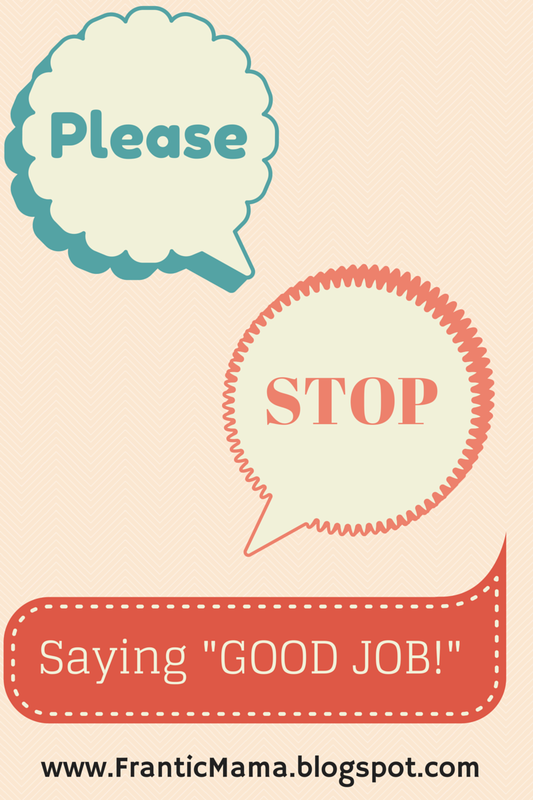 Frantic Mama: Stop Saying "Good Job!" For the love of all that is good and holy, will people just STOP saying "Good Job!" to my kids every two minutes?! When I was a high school teacher, I often used praise as a way to encourage my students-- students who frequently came into my class barely reading even though they were at least 15 years old. Some of these kids could barely write a complete sentence. So when they did make progress, you can bet I was proud of them for realizing their potential. Consequently, I didn't think too much about praise when I had my own kids. Praise = good, right? My now 4 year-old son has taught me to feel differently. It has not been an easy lesson to learn. When my son was a baby and toddler, he had a charming way of deflecting praise: he would cover his eyes, look away, or even sniffle a little if someone too enthusiastically shouted "yay! hooray! good job!" It surprised us, but it was endearing. My husband and I are modest people (I think? I hope?) and that is a trait we of course want our children to possess. When my son turned 3, things got more complicated. His reactions became stronger, and other people didn't always think it was cute. We didn't always think it was cute either. It put us in some embarrassing, awkward situations. First, trying to laugh it off...then trying to change the conversation...then explaining it to the other adult... argh. I tried everything to get through those moments. It wasn't easy. Preschool further complicated things. Everyone wants their child to make a good impression. For the teachers to see the best of their child. It is hard to ask people if they can simply "tone down" the praise and hoorays that, honestly, are hurled at children left and right these days. Who am I to ask other people to hold their tongue? Wouldn't it seem odd to mention this quirk to others? But, then again, isn't it my job to set my son up for success? I was torn. I'm still torn. Here's the twist: it can still drive me insane when my son barks at a stranger to "not say that" if they tell him "good job!" (and Trust Me when I tell you that I may stay calm in the moment, but I am of course talking about the incident with him later in private), but recently, I see it more from my son's side: the constant stream of good jobs can get really, really annoying sometimes. Because here's the thing: nice, well-intentioned people have told my son that he is doing a "good job" for the stupidest things. I'm wondering if he is onto something. Because, while no, it is not okay for him to yell at someone who is trying to be nice, maybe it is okay not to praise someone's every move. I am starting to see how freaking annoying it is when a kid scribbles some blue crayon and someone booms GOOD JOB! like he just won the basketball tournament. Why? I picture my son wondering. Why are you so excited about me right now? What did I do? It makes me so uncomfortable. I have no answers here. No big revelation other than that seeing things from my son's eyes helps me retain some shreds of patience and sanity when he seems about to crack. Recently, he is trying harder to control his initial outbursts; he is slowly learning that such reactions aren't going to make new friends. I am slowly learning to save my praise for the times when we both know he has earned it. You can read more of my work on: Mamalode and What the Flicka?